It’s no secret that one of the biggest pain points for enterprises today is the rapid growth of unstructured data. The ability to manage, protect and archive an organisation’s most valuable assets is arguably one of the biggest strains on IT department budgets. The advent of cloud technology has many organisations looking for a way to leverage Pay-as-You-Go cloud storage offerings to assist in the data life-cycle process. The difficulty with these offerings is that data is stored as objects rather than on file systems such as NFS and CIFS, meaning integration with existing business processes and solutions isn’t straight forward. Cloud Storage Gateways resolve integration issues by bridging the gap between commonly used storage protocols such as iSCSI/CIFS/NFS and cloud-based object storage. Storage Gateways take the form of a network appliance, server or virtual machine that resides on-premises and typically provide storage capacity for frequently used data. As data ages and is accessed less frequently, it is moved into cloud storage which can cost considerably less than traditional on-premises storage offerings. Additional features are integrated into cloud Storage gateways such as backup technology to protect large volumes that can no longer be protected using traditional means. Microsoft have a competitive hybrid cloud storage offering called Microsoft StorSimple that takes into consideration a wide range of existing business pain points such as backup and Disaster Recovery. Microsoft StorSimple is a physical on-premises storage system that uses three tiers of storage: SSD, SAS, and cloud storage. A number of models are offered based on storage and performance requirements, however StorSimple’s ability to leverage cloud storage as a cold tier significantly reduces its on-premises footprint compared to other storage offerings. Storage tiering – StorSimple dynamically moves data between the tiers of disk based on how active data is, providing efficient data storage and maximum performance for heavily used data. iSCSI protocol support – StorSimple volumes are provisioned as block storage, allowing them to be used for file, database, or hypervisor attached storage. Encryption in-flight and at rest in the cloud. High capacity – The largest StorSimple appliance can currently store up to 500TB of deduplicated data (including cloud storage) in eight rack units. Snapshot backups – Traditionally, snapshots were not considered a reliable form of backup due to their reliance on the source physical storage appliance, however StorSimple snapshots are stored in geographically redundant storage accounts in Microsoft Azure, meaning six copies of data are stored across two geographically separate regions. Single pane management – All StorSimple devices in an organisation, regardless of location, can be managed from the same interface in the Azure portal. Near instant DR – In the event of a disaster, a backup can be cloned and mounted on a virtual or physical StorSimple device and brought online. Only a fraction of the volume needs to reside on the target StorSimple for the volume to come online. Virtual StorSimple – Virtual StorSimple devices can be provisioned in Azure to provide DR and test capabilities for volumes that were previously, or are currently, hosted on-premises. Deduplication and compression – Microsoft StorSimple is able to minimize disk footprint by using global deduplication and compression across on premise and cloud storage. Highly available physical storage architecture with dual components, to prevent single point of failure. All StorSimple devices are managed from the familiar Azure Portal. 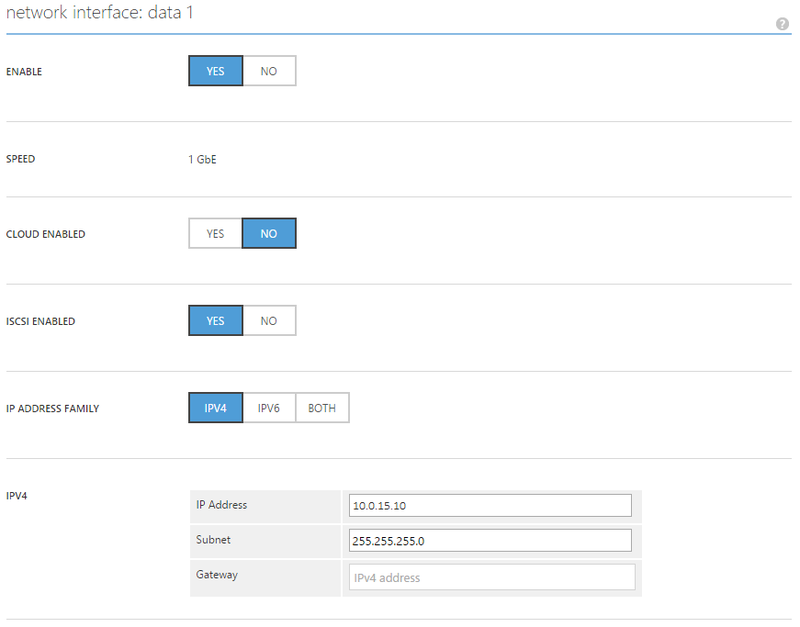 The sample below shows five StorSimple devices with four being virtual and residing in Azure, and one a physical StorSimple 8100 running on-premises. 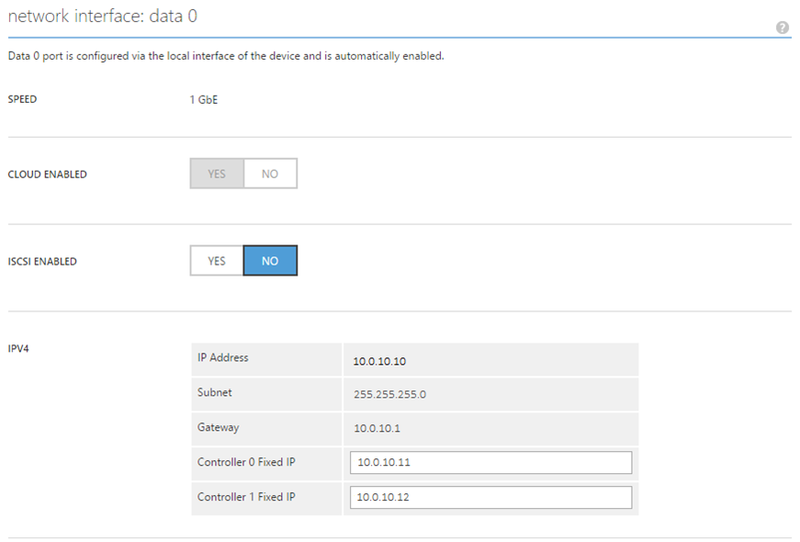 Each device can be selected and configured via the Portal and shown below where I am managing the network interface configuration for a physical StorSimple 8100 device. Compared to traditional storage systems, provisioning storage is incredibly simple (no pun intended!) Once a device is selected, the administrative user navigates to the Volume Containers menu and selects to add a Container (shown below). 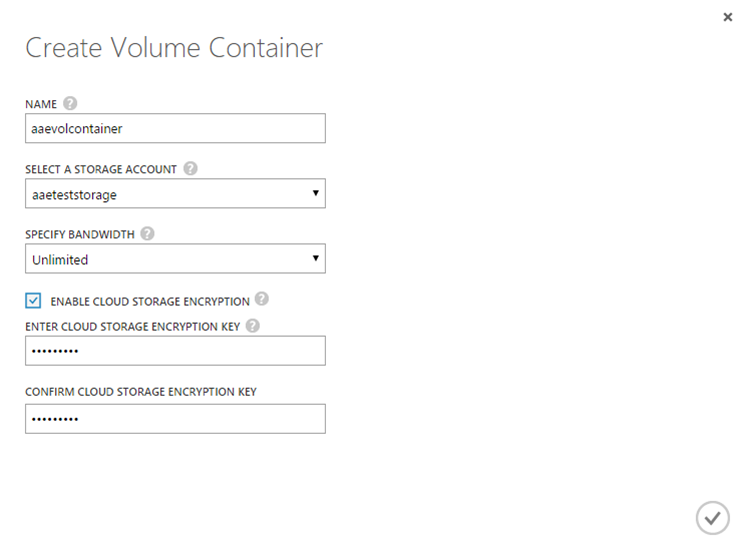 A Volume Container is used to group Volumes that share a storage account, bandwidth, and encryption key. Best practice suggests a geographically redundant storage account is used in Azure to ensure data is highly available in the event of a regional disaster. Bandwidth can be throttled to ensure the WAN link is not saturated when tiering to cloud storage. If cloud storage encryption is used, an encryption key must be specified. Once confirmed, the Volume Container is created and appears in the list of Containers for the device as shown below. 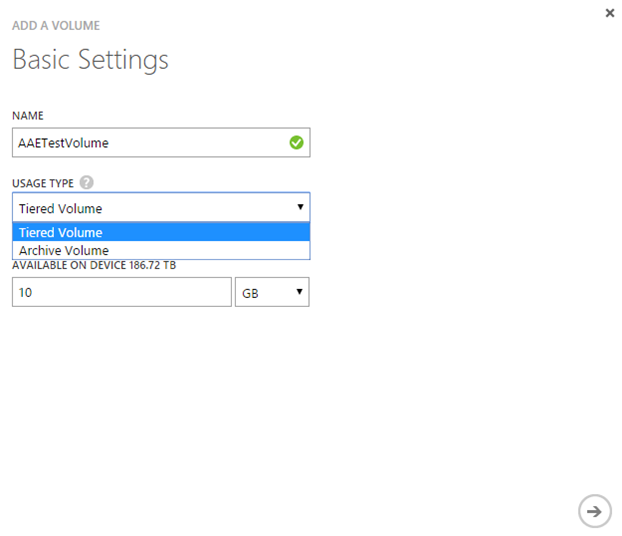 Notice that a usage type of “Tiered Volume” or “Archive Volume” can be selected which allows the StorSimple appliance to better judge where to initially place the data that is being moved to the Volume. This can be handy for organisations that are looking to migrate stale data they are required to keep for compliance purposes to the cloud. Also note the capacity specified is always thin provisioned. After confirming the basic settings, iSCSI initiators (servers) are specified that are allowed to access the volume. Once this is completed, the volume appears in the Volume Container page. The Volume can now be attached to a host via the iSCSI protocol. Assuming that iSCSI connectivity is already configured, we log onto the server and perform a scan for new disks, which discovers the Volume recently provisioned as highlighted below. This Volume can now be brought online, initialised, be assigned a drive letter, and then function as a drive on the server as shown below. Pretty simple stuff! One of the biggest benefits of StorSimple is its ability to provision traditional block storage which can be leveraged by familiar operating systems. Many other platforms offer storage in NAS form, requiring administrators to learn and manage another platform. Now that we’ve provisioned a file system, how do we protect that data? Snapshots are used to protect data on a StorSimple in an efficient and reliable manner. Due to global deduplication, snapshots consume minimal storage in the cloud while still providing reliable protection due to Azure’s geographically redundant storage. StorSimple backup policies and data protection is configured in the Azure Portal. Administrators navigate to the backup policies section of the device and add a new policy. Multiple Volumes can be grouped together within a policy to take crash-consistent snapshots across the multiple volumes. A schedule is then defined. A policy can only have one schedule, however multiple policies can be defined for a Volume. For example: a daily backup policy can be used perform daily snapshots of a Volume and retain them for short periods of time, while a monthly backup policy can take a snapshot of the same Volume once a month and retain snapshots long term for compliance purposes. Additionally, a snapshot can be stored on either local storage for rapid restores or cloud storage for resiliency. 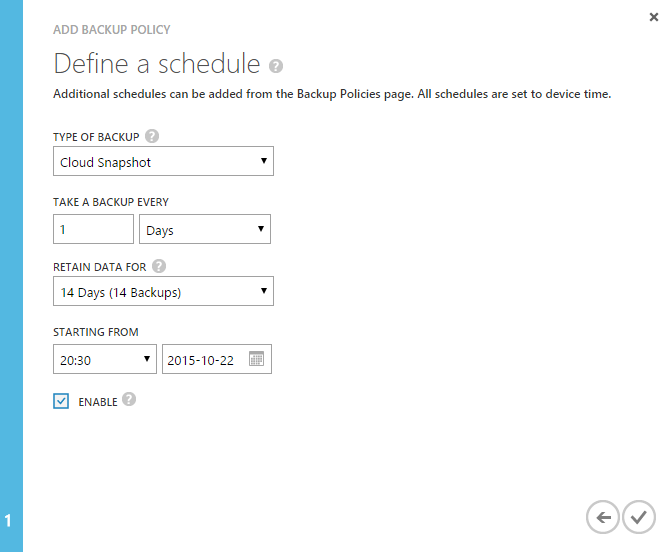 Once the schedule is defined, it appears in the backup policies tab. Although the first cloud snapshot can take some time, as all Volume data that resides on-premises needs to be copied to the cloud, all subsequent snapshots are quick, as only the changed data is deduped and copied to cloud storage. Below is a view from the backup catalog, after a backup is complete. Well, that’s it from me for now! Stay tuned for part two, where I will dive deeper into disaster recovery scenarios, data mobility and performance monitoring.